Up and packed up we hit the barrier highway back to home base, so grateful to be able to make this journey, see so much of our amazing country and met so many beautiful and inspiring people! As with any journey sometimes you need to make change when challenges arise which we did, but we wouldn't change a thing. 47 days or 6 weeks , 5 days. 100 odd hours of driving. 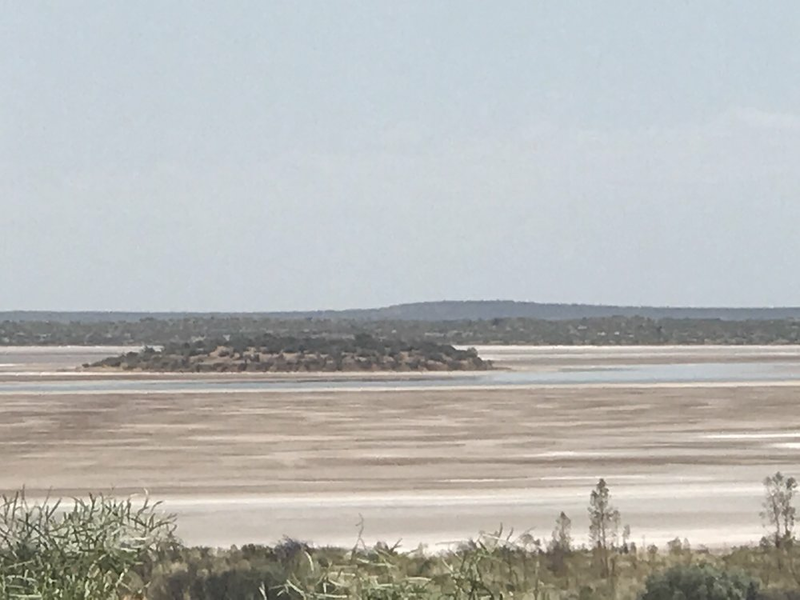 Visited 4 states - NSW , Qld , NT and SA. 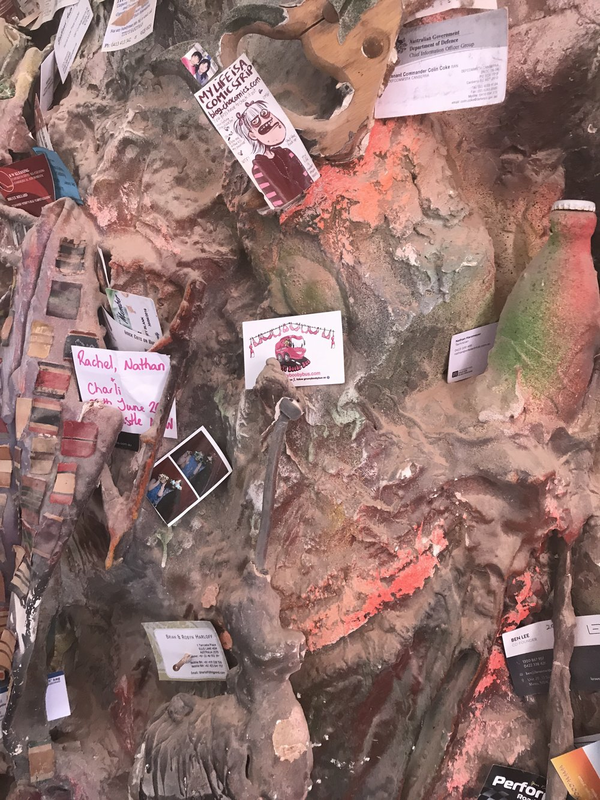 Left bras and stickers in every state. Calls to the NRMA was 3 - Disel line - Raditor- Window. Ranged from 6 degrees to 44 degrees. Emus, Kangaroos, wild goats, wild pigs, snakes, lizards, sheep, cows, echidnas horses,camels, birds, larmas , dingo. 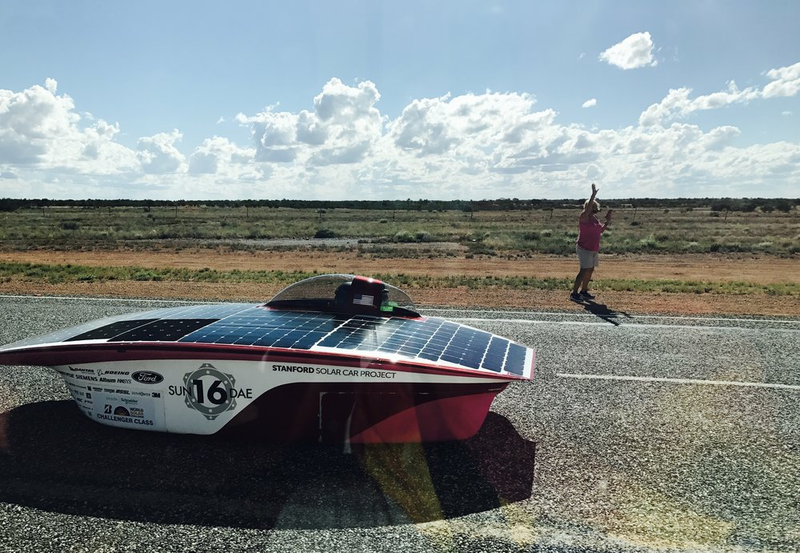 Solar cars, road trains, trucks, tractors trains, helicopters, planes, ships, boats and automobiles new and old. Mountains, hills, Desert, plains, creeks ( mostly dry) rivers, oceans, dams, lakes, waterholes, gorges, salt lakes. 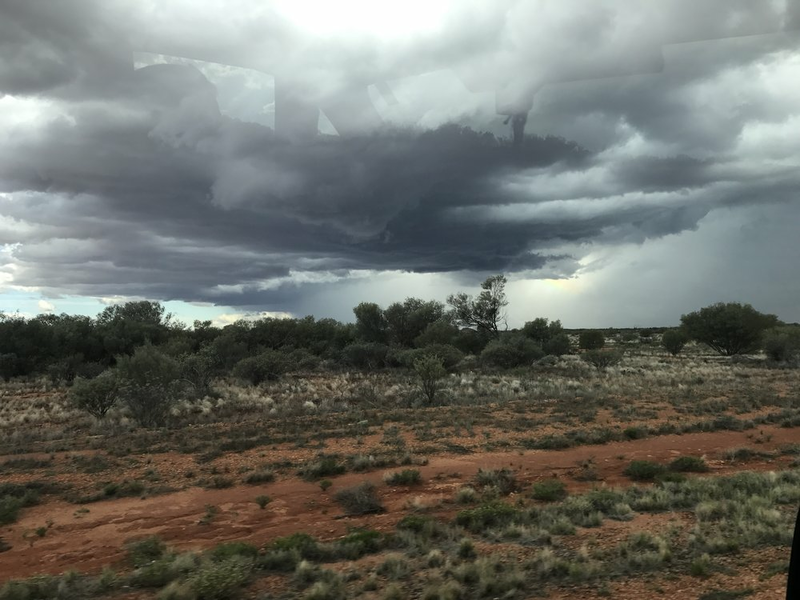 We saw the amazing Uluru both dry and wet. 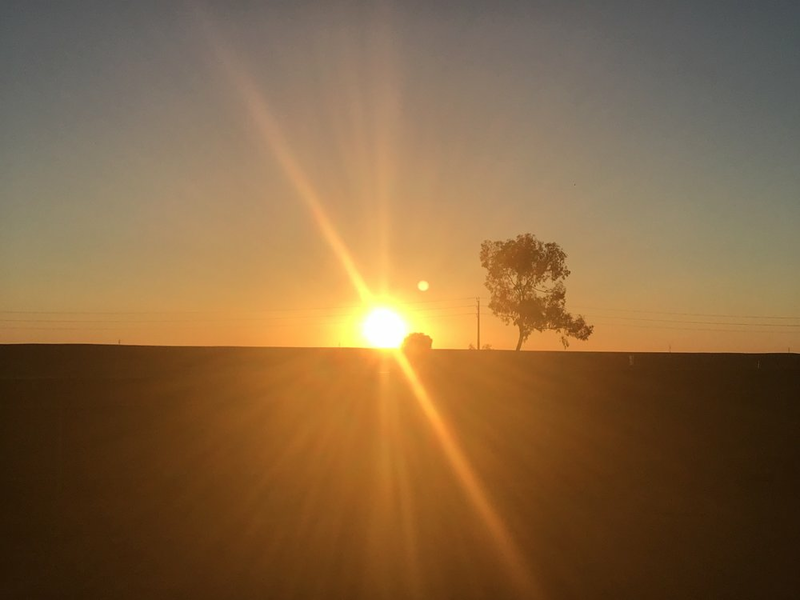 Were delighted by amazing sunrises and sunsets, clear blue skies, clouds, rain, rainbows and sun. We went Underground and up in the sky. We were photographed by locals in every state, and travellers national and international. Groovy chicks, babes, girls, gals, two pink ladies. Groovy has been called Awesome amazing, wonderful, inspiring, beautiful. We have been back up singers and dancers, walked in a parade. Drag queens, drag kings, men and women young and old from many cultures, pink sisters, and some amazing inspiring people. 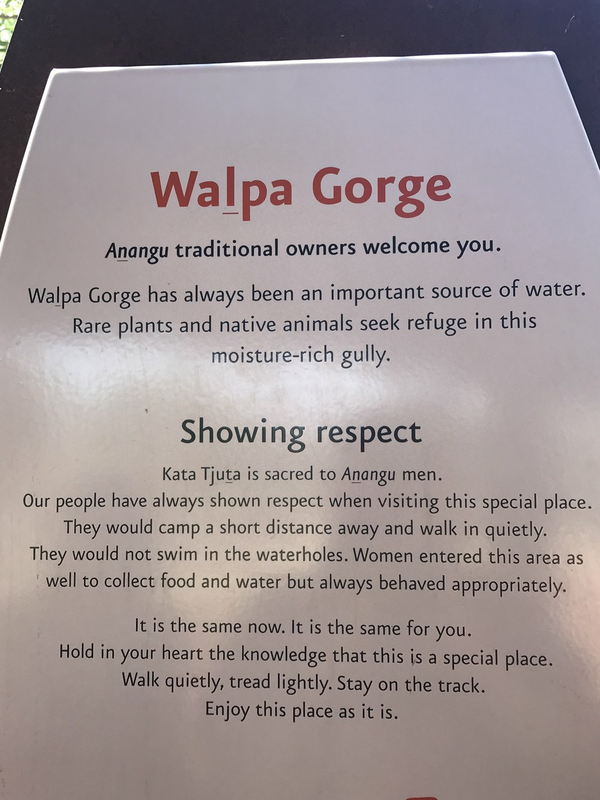 We have learnt Aboriginal language, cultural and painting. We tried to loss weight but is just stayed with us didn't want to miss out!!! 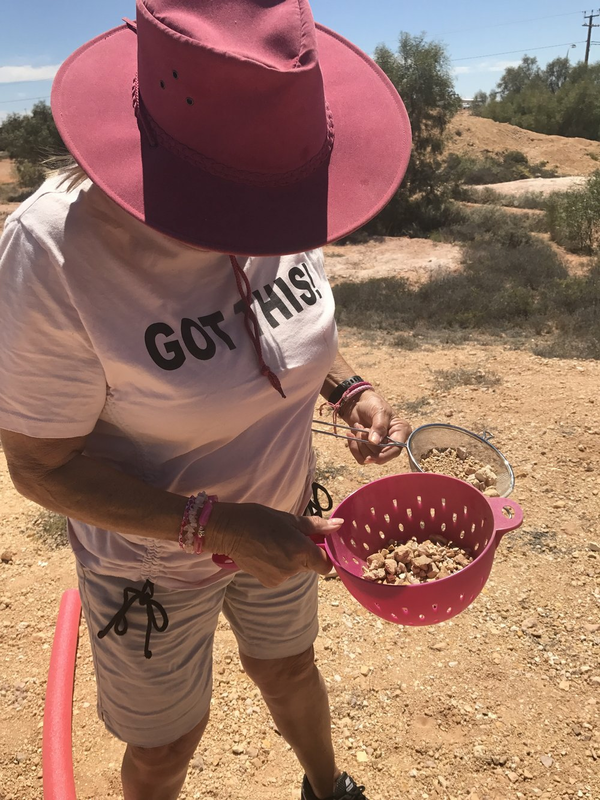 We tried to lighten the load in Groovy but we seem to just add at every stop, pink hats, paintings, candles, clothes, books, maps, dirt, shells, rocks and FRIDGE magnets! We ate Roo Poo, Kangaroo and 10 cans of baked beans. Laughed so hard our stomached ached! Made up games, painted rocks, decorated a tree pink. 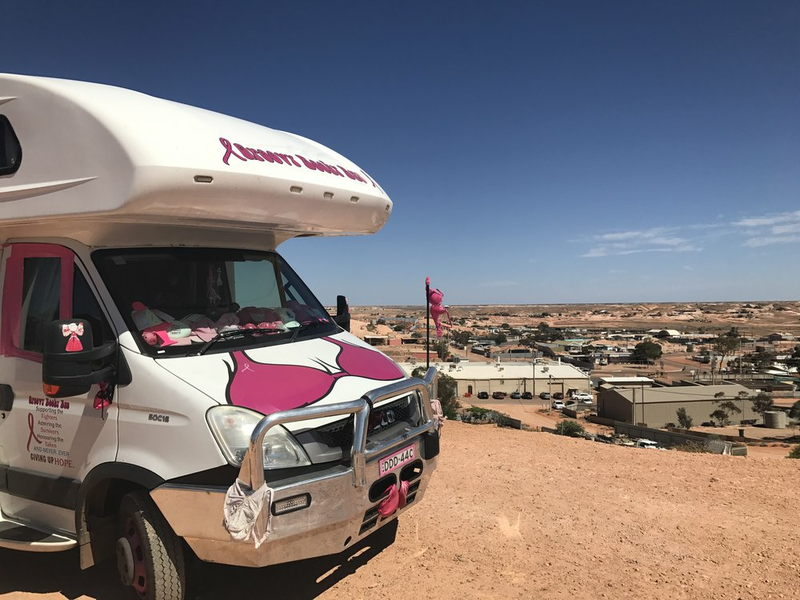 Today we travel back to Cobar about 20kms out of broken hill seems we have blown a Bra!!! 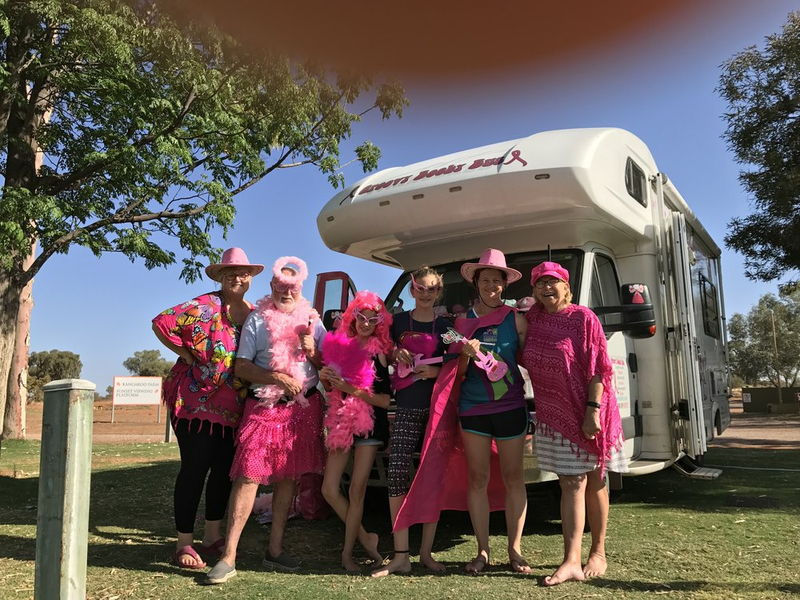 New Bra now flying we pass the Bra, bottle tree, coffee cup tree and have keep some pink to make a pink tree! 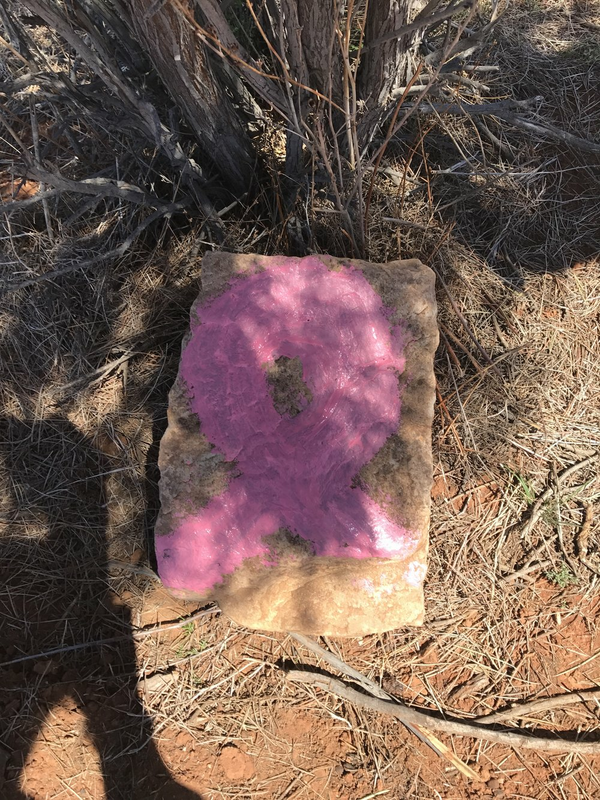 We also had spotted painted rocks on our trip so decide to do a breast cancer one! 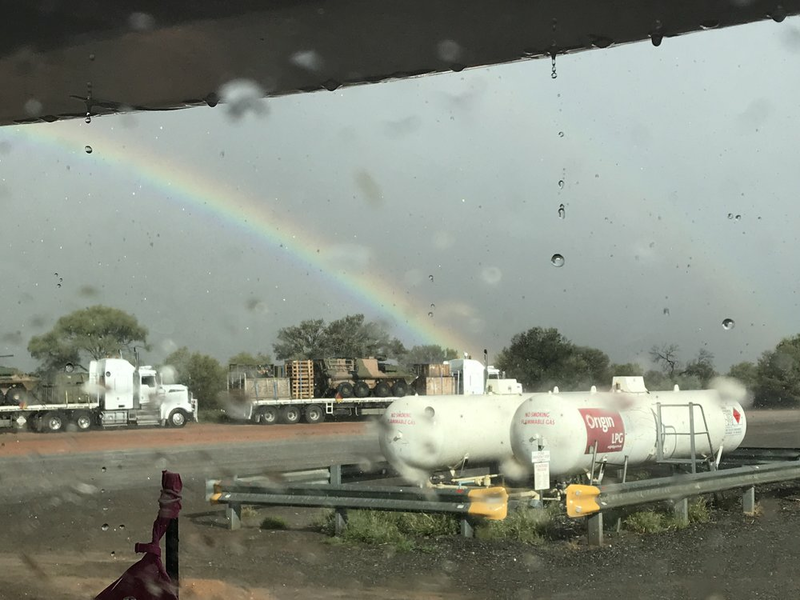 Today we say goodbye to South Australia as we head back to Broken Hill, but not without a stop in at the last Pub in SA who were so supportive and gave us a royal tour! 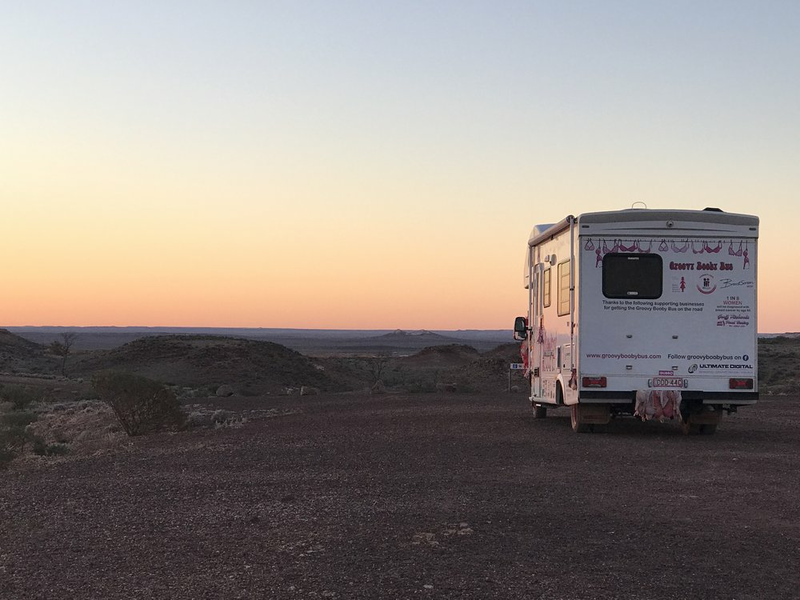 Today it is off to Peterborough, flying the bras through the Flinders Ranges with stops at Wilmington and we catch up with lady we met in Broken Hill who was proud to tell us she had been for her Mammogram and all clear! 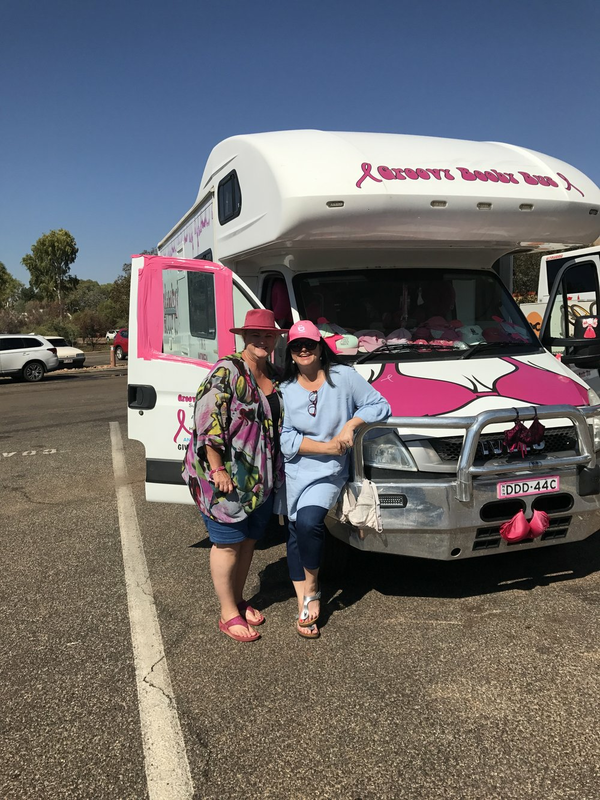 With a little bit of rain we take a drive to Whyalla and a happy to meet locals and see shops Pinked Up to support Breast Cancer Awareness Month. Fly the bras along the beach and visit Mount Laura Homestead. And then we find George Ave Fish and Chip shop and met owner Lorraine who is also pinked up! 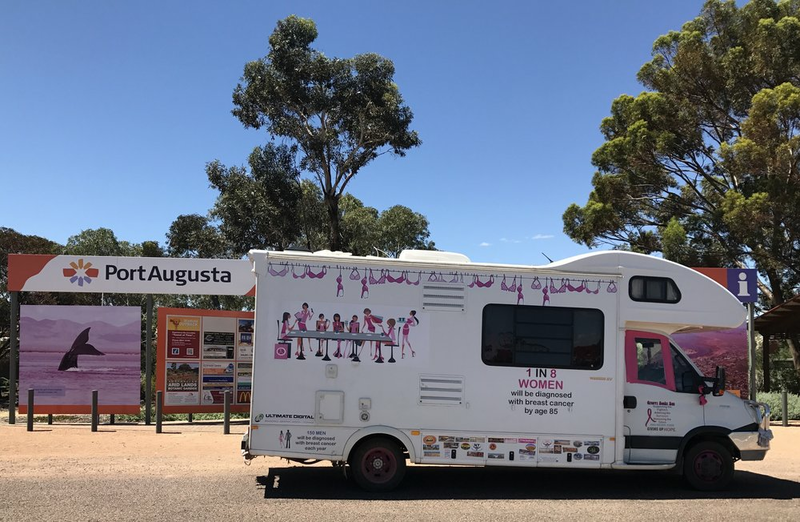 Our hump day stop Port Augusta a small city seaport located on the East Coast of the Spencer Gulf just 188kms down the road. They is always time to stop and chat with fellow travellers who were keen to get a stubbie holder! 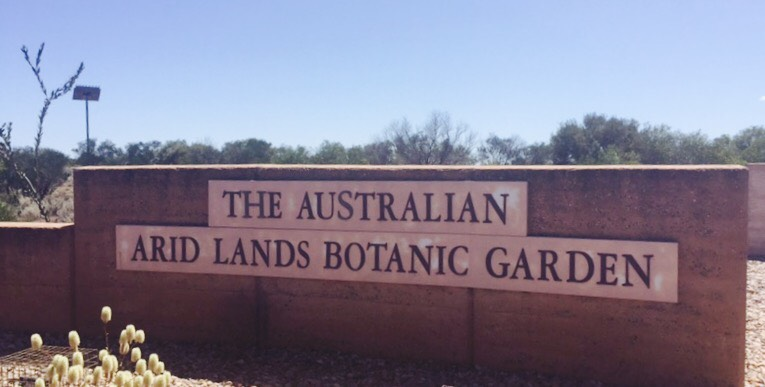 Explore the The Australian Arid Lands Botanic Garden and the Wadlata Outback Centre! 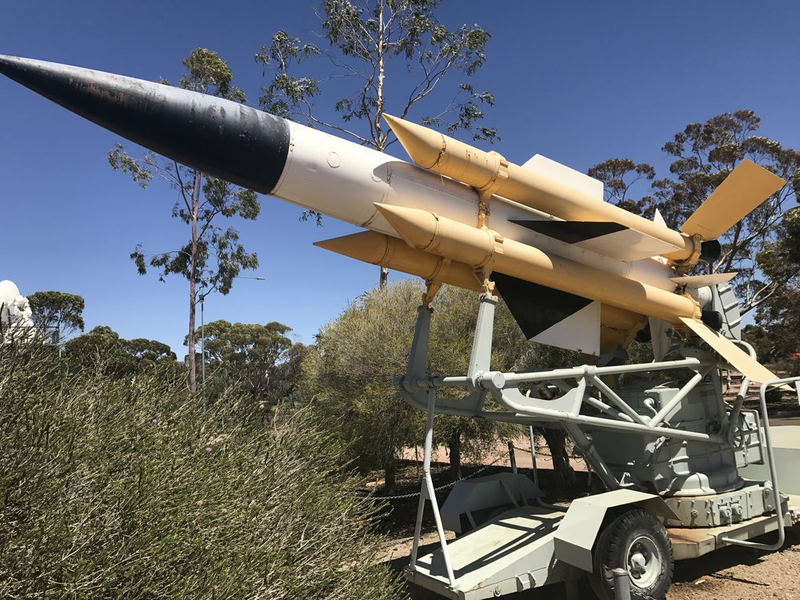 Today we stop to admire the Salt Lakes then a comfort stop at Pimba which is basically and old roadhouse and pub then on to Woomera in the far north region of South Australia, the afternoon is spent checking out Woomera Aircraft and Missile Park and Heritage Centre. Bit like I say with Pink , no one ever says to many sunsets so here is another one to enjoy. 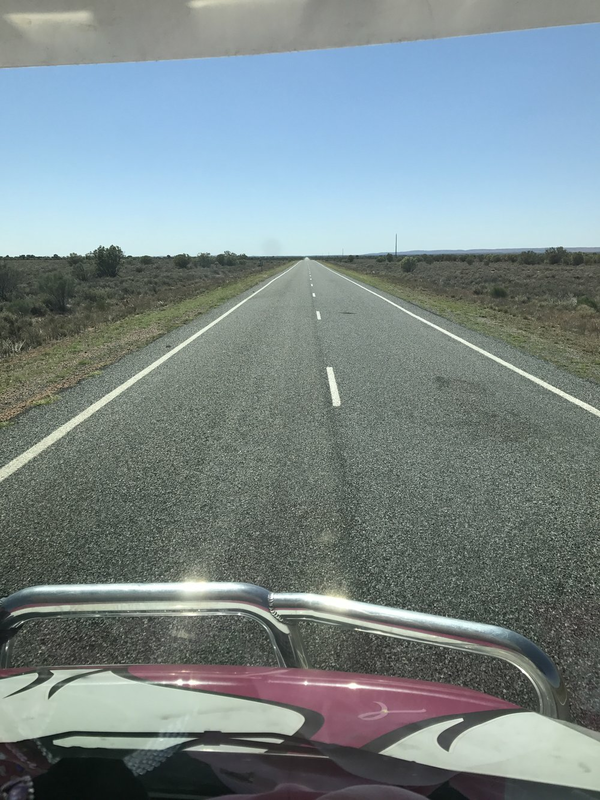 Just a short 2 1/2 hour drive along the Stuart Highway to Glenbambo, while driving listening to UHF one truckie says to another you should see the weird look Bus coming your way it has bras flying off it! We certainly get people’s attention and brighten their days! Up early to catch the Sunrise at The Breakaways just beautiful and so peaceful. Some more sightseeing around town and at Crocodile Harry's interesting place. Then head to the RSL club for dinner and chat to more locals. 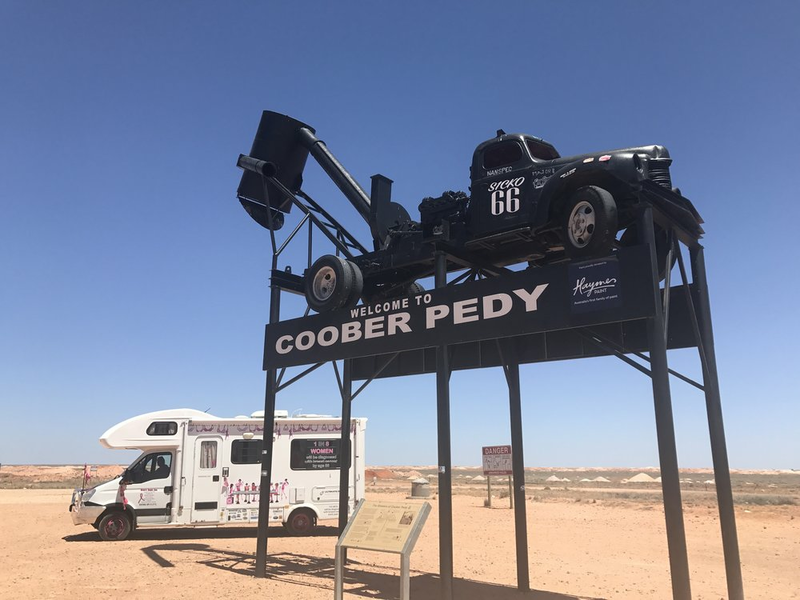 Explore Coober Pedy and meet some of the locals and fellow travellers. 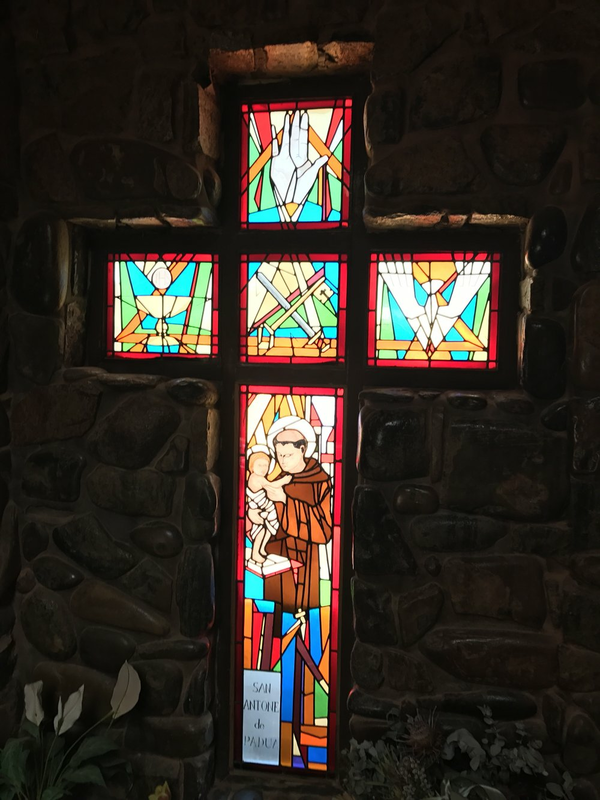 Underground churches, the Big Mine, Boot Hill. Local Tanya was happy to help spread the word. Today we leave the NT we have learn so much about the culture and language the video is a reminder to all. 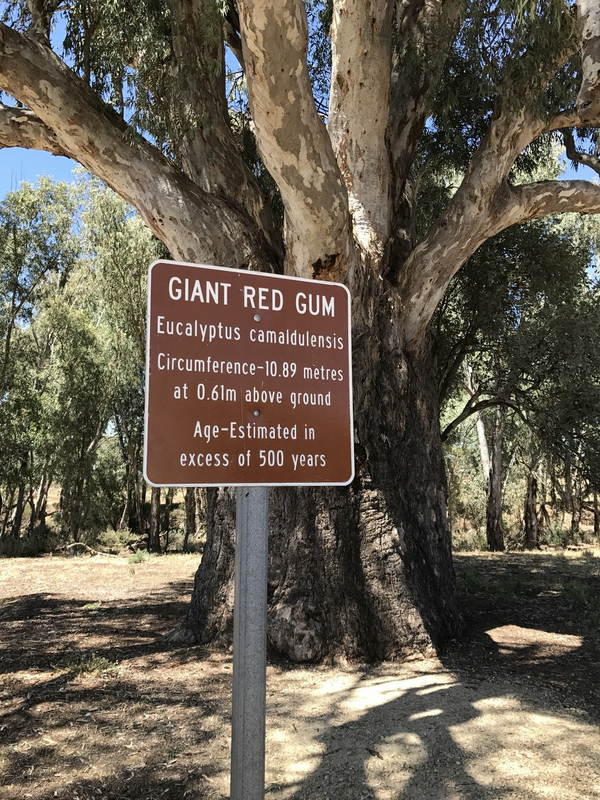 The next state to explore and start the conversation is South Australia. The ever changing landscape just amazes us. Easy lay day to catch up on washing, time to leave our stickers, bra and knickers! 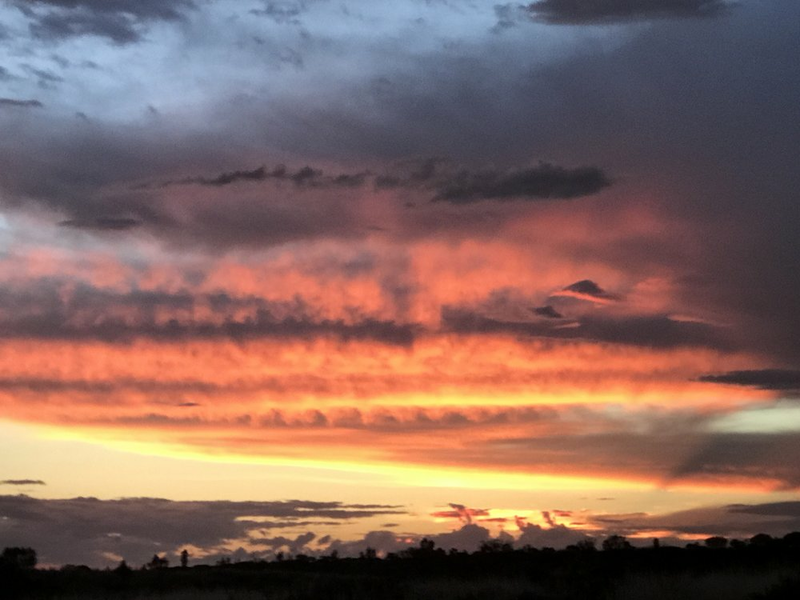 Then enjoy our last sunset in the NT. Tomorrow will be a Bran Nu Dae and we will head into South Australia. Monday we flew the bras twice around Uluru, caught up for dinner with Jen Cowley and Mark Horton for Dinner. Tuesday wake up to a rare sight out the windows a lake after a night of pouring rain and storms. 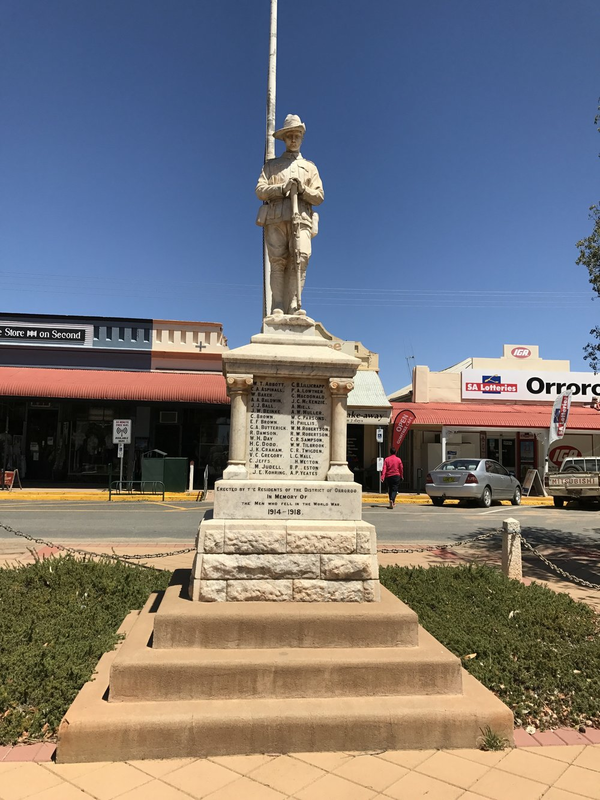 Leave Curtin Springs for the short hour drive to Yulara. 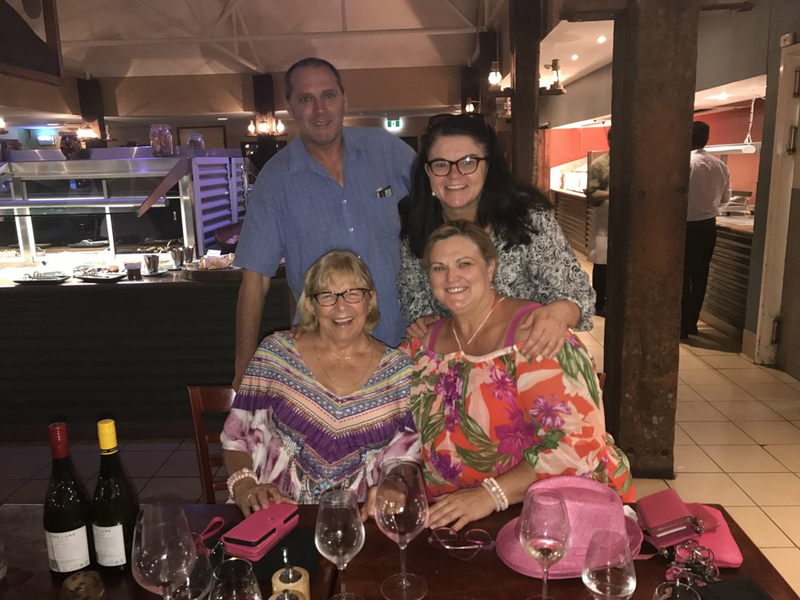 Time to catch up with family and friends with 3 days at Desert Gardens Hotel. Groovy is sparkling and parked were everyone can see her, and is still getting attention. We enjoy a Sunset tour and BBQ, camel rides, field of lights, helicopter ride over Uluru which is breath taking. 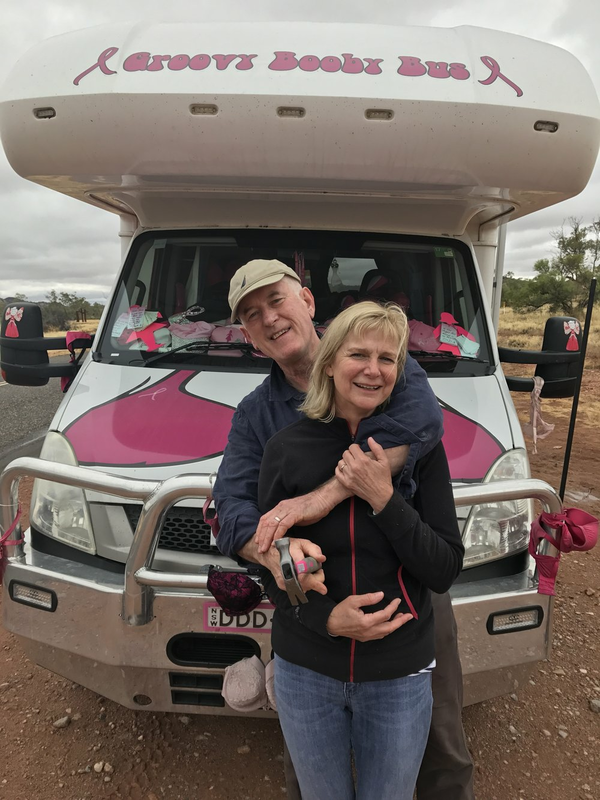 Up time for photos with adoring fans who where happy to Pink it up, a quick wash down for Groovy, then on road to Curtin Springs, stop off at Mt Connor Lookout and salt lakes for photos. 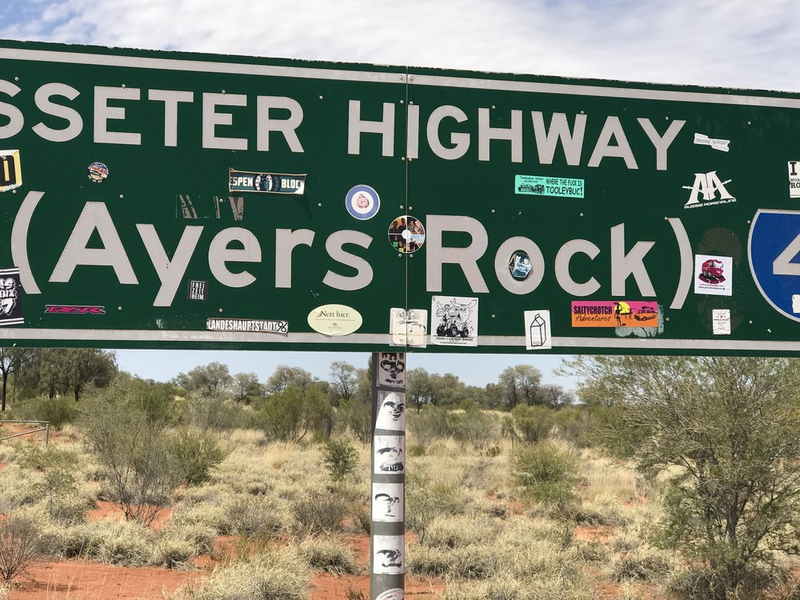 Time for some sight seeing around Alice Springs. 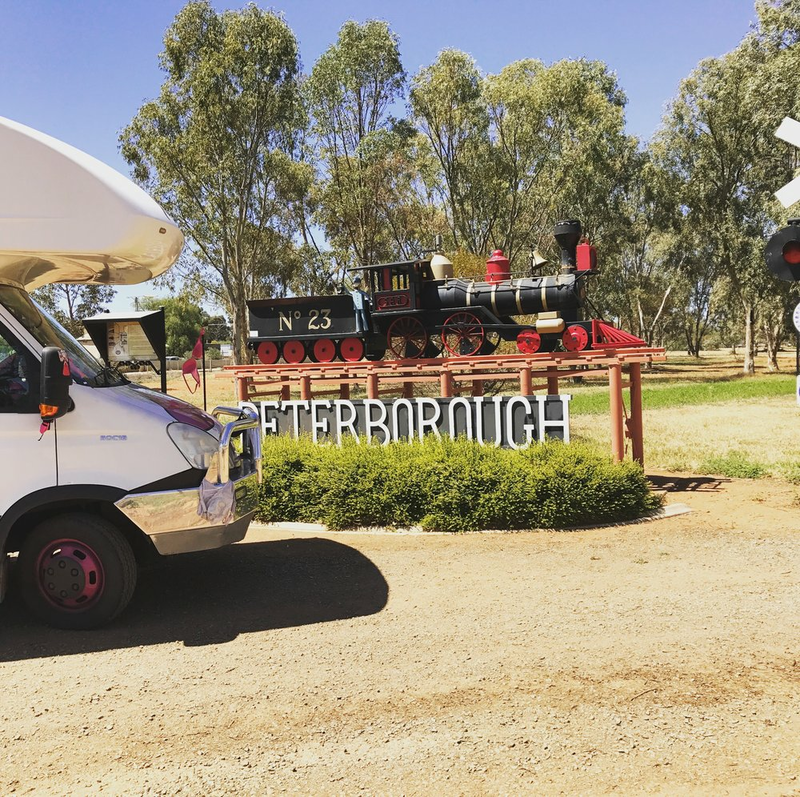 Road transport Hall of Fame, Old Chan Railway, National Pioneer Women's Hall of Fame, Old Goal , Telegraph Station, chat to some of the local indigenous people and a spot of shopping. Wednesday afternoon it is on the road to Erldunda, time to wash the bras and catch another spectacular sunset. 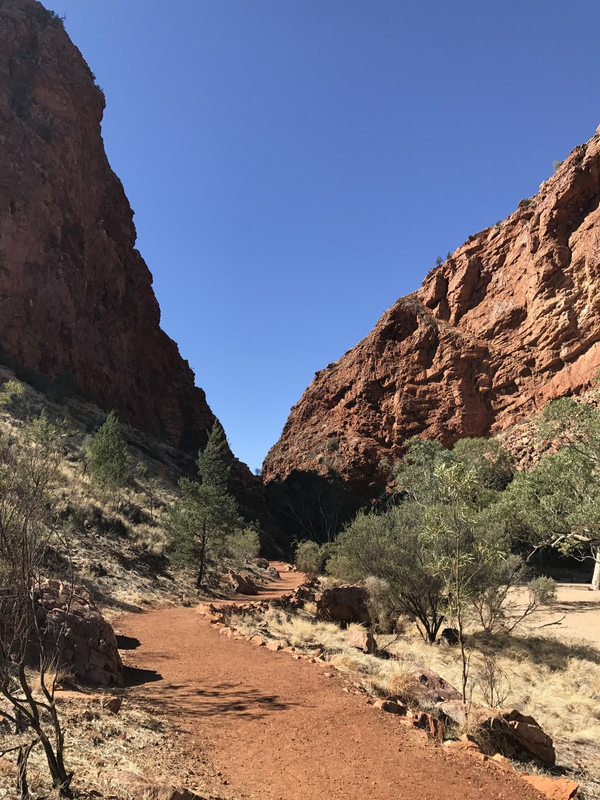 Head back to Ormision Gorge chat to a beautiful young lady she is free camping travelling with 4 kids from Melbourne, she tells us that 2 of her sister in laws had had breast cancer one a survivor of 17 years - the other she help nurse for 2 years , losing her battle at just 45. 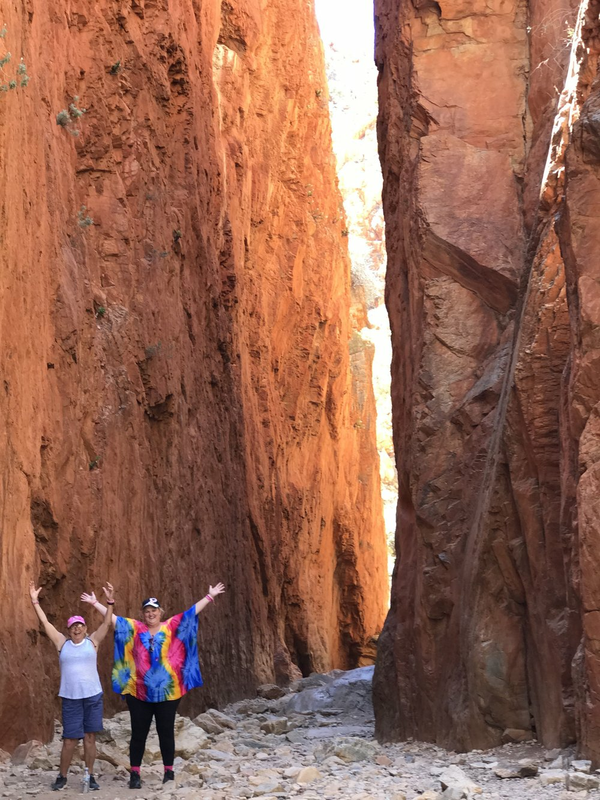 Sunday we spent looking around Glen Helen Gorge in a mild top of 14 degrees having a photo with Adele and her family. Wake up to light rain. 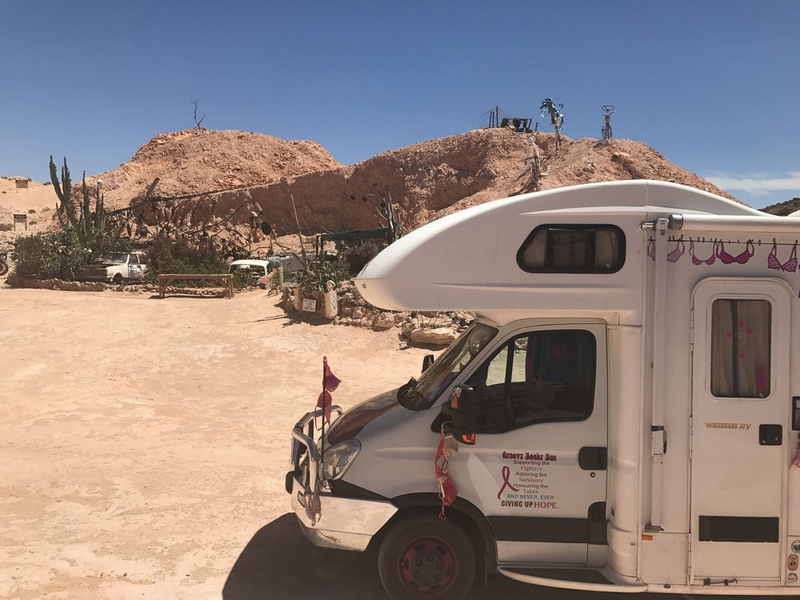 Meet Lola when we stop at the Tropic of Capricorn for a photo, she is travelling around Oz by herself, Lola leaves a message of hope for us to take on the trip for her step daughter who is currently fighting breast cancer. We comment about her travelling alone she tells us she lost her husband to cancer and promised him she would travel Australia and scatter his ashes. 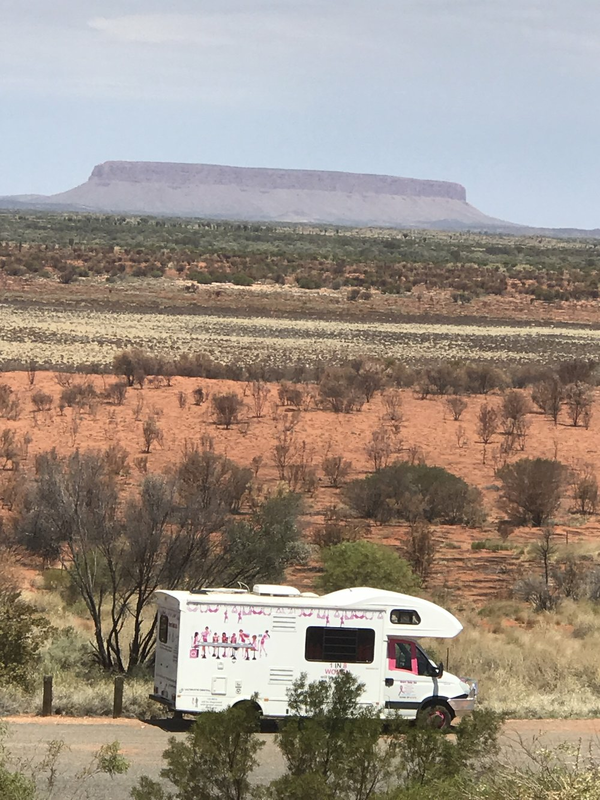 We arrive at Alice Springs grab a bite to eat for lunch and on recommendation from a couple we met last night at Gemtree decide to head out to West MacDonnell National Park then work our way back in. Now all I will say it took about 1/2 hour for Viv to get us out of town! Maps and google couldn't help, lucky the man at local IGA could! Ok here we are driving along in amazement of the scenery of the West MacDonnell ranges and miss the turn off to our planned destination Ormiston Gorge, so pull off and turn around and then hear a noise in the back left tyre first thought we have blown a tyre pull off road again and hop out just as a car goes by, and it stops and turns around to check we are ok the couple names Clare and Kevin Love, after we all check tyres and agree they all are fine! 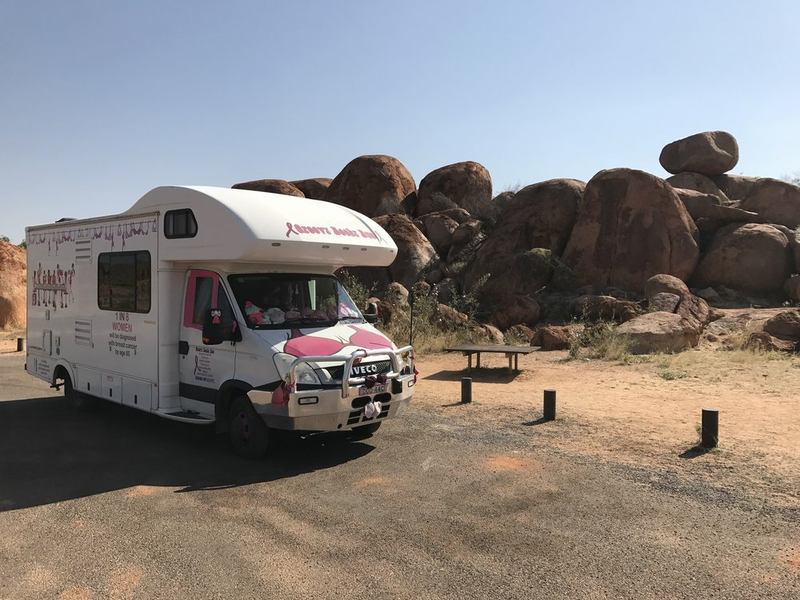 Clare says maybe you have picked up stone, so we take off and noise continues, they had followed us and gives us the news that we have a huge rock lodged between the tyres! Kevin crawls under in this lovely clothes, then say do you have any tools, hum yes not sure what he said maybe a hammer and if I can brake the rock up, so I find my Pink hammer and he goes to work, about 15mins later the rock is gone, and no damage to the tyres we are back on the road. We will be every grateful for their time and help, I apologise to Kevin who is now covered in Red Dust, he says it's ok due to change them anyway, Clare comments it will be another story we can tell from our trip. 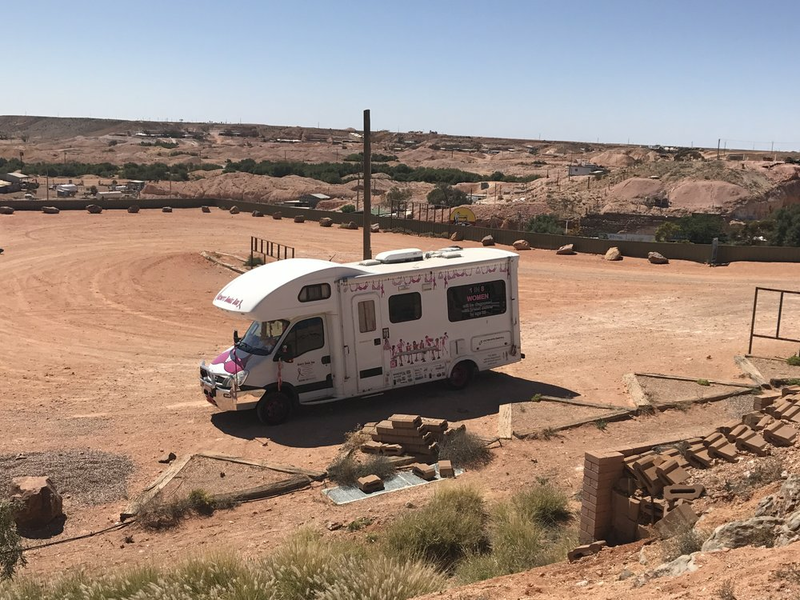 Adele comes straight over she is a pink sister diagnosed at 50 and 3 years down the track, Her husband Chris and Children Ryan and Kate have been on the road 3 weeks travelling from Melbourne and heading back tomorrow.